Welcome to Day 2 of One For the Boys Holiday Edition. I am so excited that you could join us! 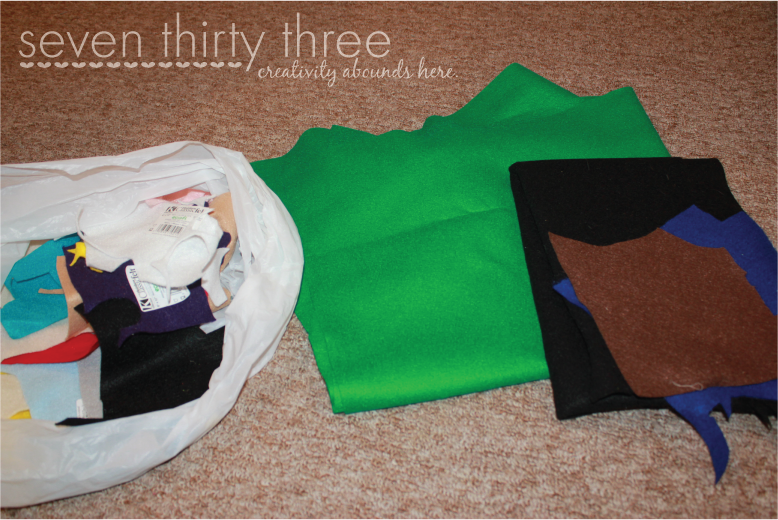 We have some really fabulous, boyish projects lined up for you! And don’t forget to get in on our One For the Boys GIVEAWAY! 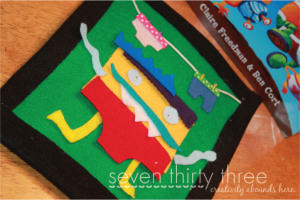 I am so thrilled to have Kim from Seven Thirty Three here to share her Silly Felt Alien. Kim’s blog is full of creative ideas, fabulous tutorials and free printables! She is also a blog designer and has done a wonderful job of sprucing up this here blog. Take it away Kim! 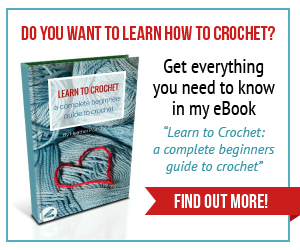 Hi Dragonfly Designs readers! My name is Kim and I blog over at seven thirty three. I am so excited to be a part of Heather’s new Boy series. I host a weekly link party dedicated to JUST boys every Thursday. Since crafting for our boys seems to be a bit harder than for girls I decided when I first started blogging that I wanted to be a hub of ideas so that our little guys don’t get the shaft! But seven thirty three is not only boy-oriented. To be fair, I also have a girl linky party on Wednesdays, and you’ll find tons of free printables and party ideas as well. My most popular party post is my daughters Pinkalicious Second Birthday. 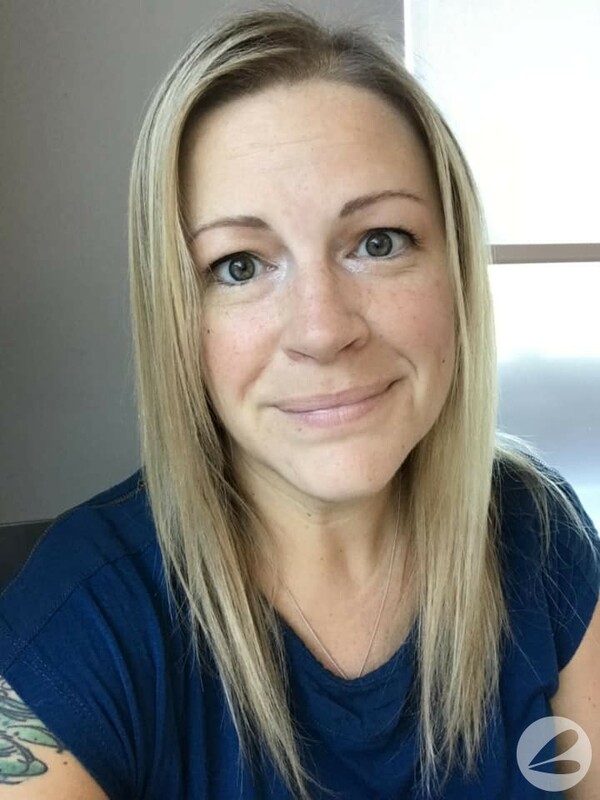 On top of all that I also am the owner of seven thirty three – – – custom blog design, where I get to spend my time doing something I enjoy – creating awesome designs for other wonderful bloggers! If you would like to spruce up your blog for the new year, look me up! 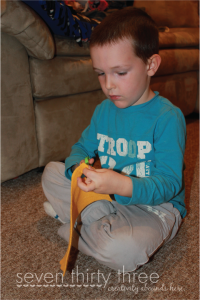 Today I am going to share with you a craft that my son Mason and I worked on together. I think this would make a wonderful gift for a daycare or pre-school gift exchange, or really, any little boy in your life. Have you ever heard of this book? I found it at our school book fair and brought it home for my 4 year old son. Let me tell you, it has been quite the hit! It really is a cute, silly story, and the pictures are so bright and fun. One of my favorite things to do to craft for boys (and girls) is to find a story that really inspires them and then create something based on it. 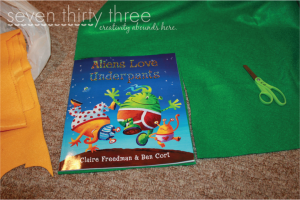 After brainstorming some ideas, I decided a NO SEW Silly Felt Alien would be a great and entertaining project, as well as something that will keep the kids interest when running errands. 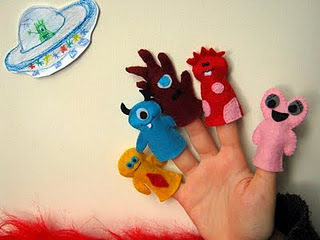 All you need is one felt sheet, felt scraps and a glue gun. 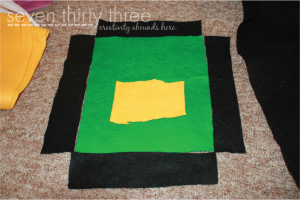 I didn’t have a full sheet so I cut a 9×12 square out of some felt by the yard that I had. 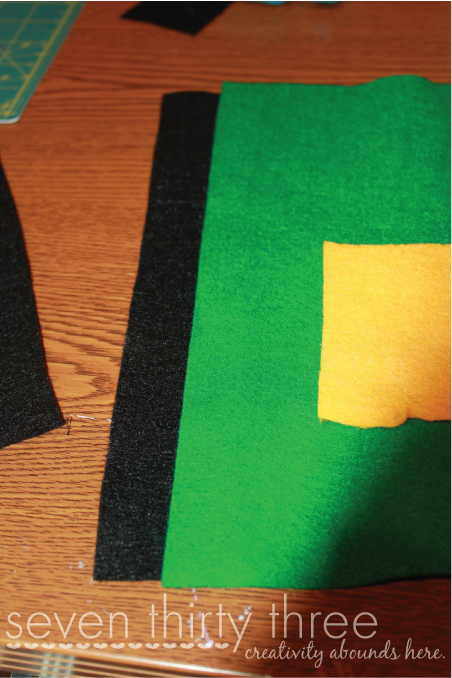 I then cut black strips of felt to bind the edges. Mason cut out the shape for the alien and then we both got to cutting out additional shapes that can serve as facial and body parts for the alien. Add googly eyes to some of the pieces. 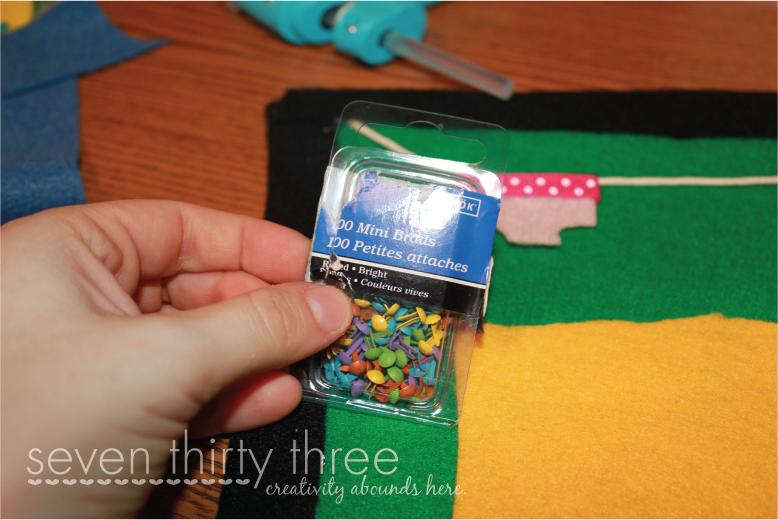 I used my glue gun to adhere the binding to the background felt. Next I glued the body to the background felt. I grabbed some string and created a clothesline so we could include the underpants – a necessity with these aliens around! I cut out some felt underpants and added ribbon for the waist band. 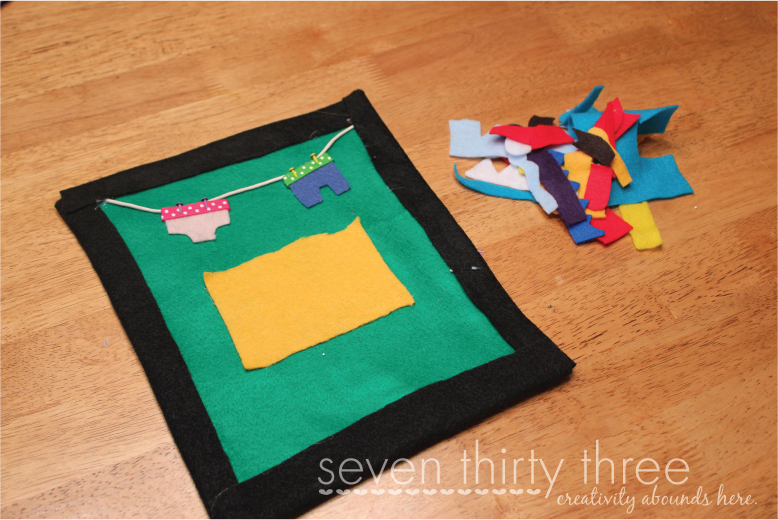 I used scrapbook brads as clothespins and glued the whole thing to the background piece of felt. I’m considering gluing a pocket to the back to hold all the pieces, but for now they are stored in an envelope, or by just folding the whole thing up in a tri-fold. 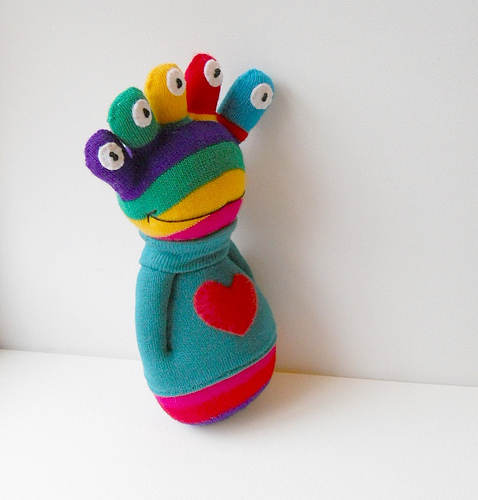 I think this Sock Alien Softie would be a great addition! Mason and I also made some crazy alien cake pops. 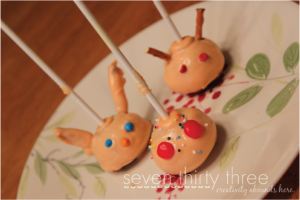 This was done with A LOT of help from his 4 year old hands, so they didn’t turn out as perfect as mom hoped, but they tasted just as yummy. I used my cake pop maker, but check out Bakerella for some good cake pop recipes and ideas. 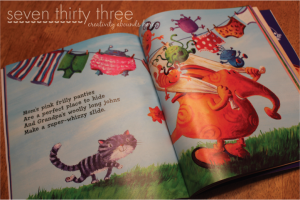 If you are stuck on a gift idea for a little boy in your life, go grab a colorful, fun story and create a fun activity to go along with it. I’m sure the fun will begin as soon as they unwrap it! Thanks for having me today Heather, and I hope to see some of you over at seven thirty three. 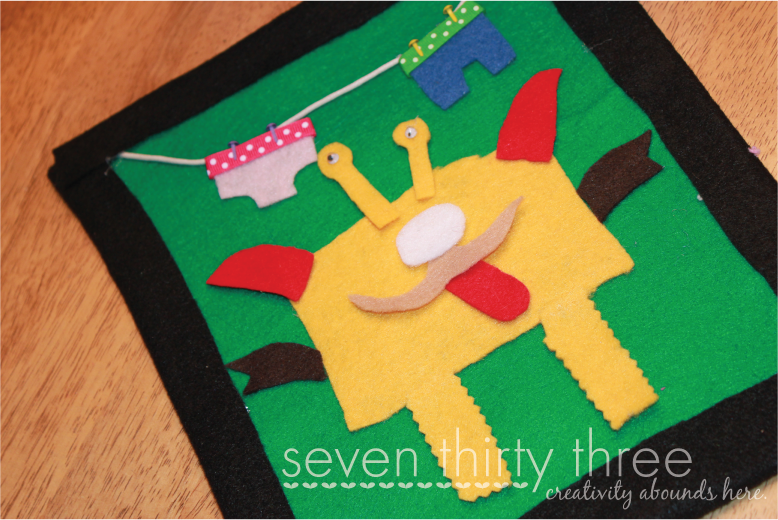 Thanks for sharing this cute Felt Alien with us Kim! Be sure to stop by Kim’s blog to say hi. See you tomorrow for another great guest post!!! This is so darling, I love crafts that go along with books! I will have to check this book out, my boy would love it! I’ve definitely need to check out this book. I can tell already that my boys would love it. You know cause it’s about aliens. And underwear. What a great craft! 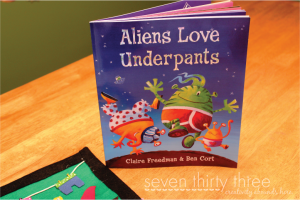 I’ll have to look up the book and that sock alien is so cute!